The Western Airlock. Before & After 2000. 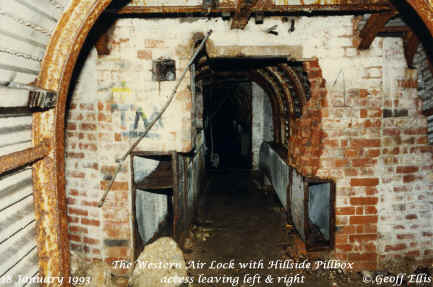 These pictures show the Western Airlock as found in 1993, and after clean-up by the Friends of HMS Forward. This is the exterior of the western airlock beyond which lies the Operational Area of HMS Forward. In the foreground, steep 35-degree inclines to the left and right gave access to the two northernmost, and the two southernmost hillside pillboxes respectively. 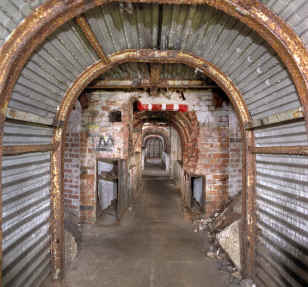 When I entered the tunnel in 1946 these slopes were fitted with skeleton wooden stairways and rope 'banisters' but these were amongst the items that quickly disappeared during the after-dark liberation of highly sought-after materials that were unavailable on the open market immediately after the war. The 2 ft-3 ins (68 cm) thick doorway was built using Sussex Engineering bricks. The left-hand picture shows the outline of a blast-proof door frame in a lintel. For safety reasons this was later painted red and white. The doorway is surrounded by a variety of openings for following purposes (going clock-wise from the bottom left); fresh air intake for air conditioning plant; over-pressure air outlet; toilet ventilation; airlock-pressure-equalising valve; various conduits for lighting and communications cables; fresh air intake for standby engine cooling. The open end of each trunking was originally protected with a strong metal grill. The western airlock is more than 12 ft-8 ins (3M90) long to accommodate large items being moved in or out of the tunnel whilst maintaining the positive air pressure within the tunnel. However, the doorway was not wide enough to allow the standby engine set and alternator to be recovered after the war. This necessitated the removal of the blast-proof door and its frame plus a considerable amount of brickwork as well. The airlock was clearly constructed after the engine set and three large water storage tanks were safely on the inside of this portal. At the other end of the airlock is the entrance to two toilets (left), and the entrance to a first aid room allegedly (right). This last seems to have been used as a galley at the outset. However the airlock doorway and the entrances to these flanking rooms posed an obstacle to the air trunking, so the three air ducts were diverted below floor level for four yards to avoid confliction and restored to their former positions once clear of these obstacles. This is visible in the right-hand picture.